Yarn tied to the shroud. We went out for a sail. Nothing too different from many other times we have been out on the lake this season. When sailing, it is useful to know what direction the wind is coming from. You can add expensive wind indicators to the top of the mast. We have plans to do that some time. Until then, we have a really cheap and easy way of finding the wind direction that works pretty well. We acquired a skein of yarn, that had both blue and red at different points on the length. We cut off about 10 inches of each color and tied them to the rear shrouds about six feet off the deck. 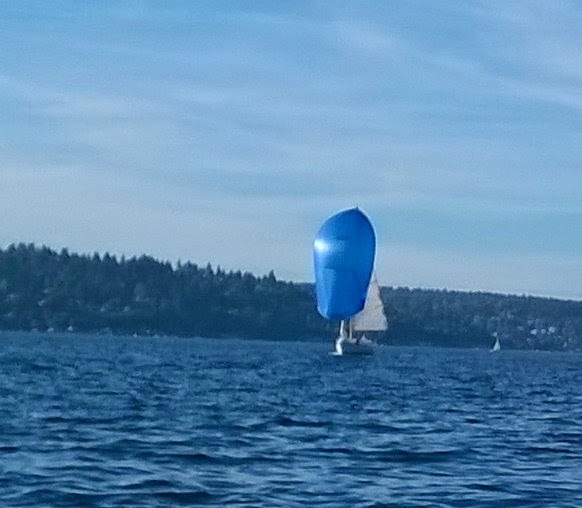 We put the red one on the port side and the blue on the starboard, to match the colors of the tell-tails the jib. You do not really need two different colors, but we like the correspondence. Now we can just look at the yarn to tell the wind direction. It is useful to have more than one, because occasionally one will get stuck to the shroud for a little while. Every boat in Washington State is required to have certain safety equipment aboard. For boats in our size category, this is the equipment we need on board. We require that everyone aboard wear a Personal Flotation Device (life preserver to landlubbers) at all times above deck. If the person is in the cabin, we require that they keep one handy, but not necessarily on, unless the person is 12 years old or younger, in which case they need to keep it on at all times. Washington State's law is actually less strict than this, and merely requires that everyone have a PFD at hand. All of our life vests are Type II Near-Shore Life Jackets. We have two that use CO2 canisters that inflate upon immersion in water. These are more comfortable than other types. We will be acquiring two more of these by next season so that all crew members will have them. We also have a Type IV horseshoe throwable PFD on a bracket on the port side railing. We have a 100' light floating line attached to it. 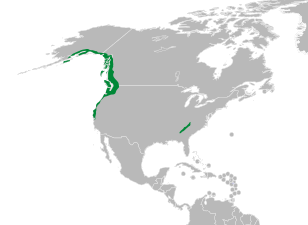 Washington State WAC 352-60-040 follows the US Coast Guard regulations. They require that you have a Visual Distress Signal available for daylight and another for night time. For daylight, you can have an approved Distress Signal for Boats Orange Flag or various kinds of flares. For night time, you can have an approved Electric Distress Light for Boats, or various kinds of flares. Some flares can act as both daytime and nighttime Visual Distress Signals. Here is the drawback to flares: They are expensive and they have to be replaced every 42 months. To meet the minimum requirements, you can get by with just a Distress Sign for Boats Orange Flag and the Electric Distress Light for Boats. However, oddly as it seems, nobody seems to be making a Coast Guard approved Electric Distress Light for Boats any more. This seems like a business opportunity for someone! ACR Electronics made the Coast Guard approved DistresSOS (product 1842), but it is no longer being made. Other lights do not have the Coast Guard approval, so will not meet the state requirement. I bought one of the ACR lights on Ebay used for about $30 plus shipping. The flag is orange and has a square and a circle in black. Flares come in various forms. If you get them to act as both day and night Visual Distress Signals, there are a couple of types that will qualify. You will need three in total, although you can mix and match what kinds you have on board. Although flares came with our boat, they expired in the early 1990s, so are not legal. The Coast Guard regulations require they be replaced within 42 months from the date of manufacture. We will replace all of our flares by next season, but with the light and the flag on board, we do not necessarily need to replace them at the Coast Guard's replacement rate..
We have a Type B fire extinguisher on board. This is required by Washington State law. We have a hand operated air horn. This must be loud enough to be heard for half a mile. We went out for a short sail for about an hour out on the lake. We hadn't been on the water or visited the boat for almost two weeks, having been out of town. As we got to the boat, we noticed that it was riding much lower in the water, with the fenders almost too low to protect the boat from the dock. This is due to the annual lowering of the lake level. Lake Washington is fresh water, but has two locks that exit into Puget Sound. Some time next season, we expect to venture out through those locks in the boat. The Army Corps of Engineers controls the locks and flood gate, which also controls the water level in the lake. During the winter, they normally lower the water level about two feet from the level they keep it at during the summer. The extra water during the summer serves several purposes. The lake drains about 8 million gallons of fresh water every time they use the large lock. The water also serves the fish ladder that allows salmon to traverse the locks. During the winter, the lower level keeps down erosion on the shores, as well as allowing repairs to docks and other lakeside fixtures. We had a choice of another docking space, but when we took into account the lower water level in October, it was just too shallow. In just the last three days, the Corps has let water through the flood gate to lower the lake level by about three inches. That is a huge amount of fresh water from a 26 mile long lake. I'll bet the people experiencing the drought in California wish they could acquire some of that! Round turn and two half-hitches. After pulling back in, we adjusted all of the fenders to ride a few inches higher to put them between the boat and the dock. Tip: To tie a fender to a life-line, you will want to use a "round turn and two half-hitches.". 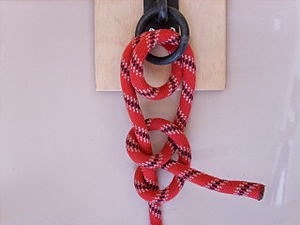 The picture shows this knot. This is one of the essential knots to know. We will be pulling the boat out for the winter soon, but we still have a few good days of sailing left.